Many of Robert E. Howard’s Conan stories were attempts at writing stories in H. P. Lovecraft’s unique horror style. Howard eventually assimilated the artistic influence of Lovecraft, and was able to include Lovecraftian elements in his Conan stories without aping his Providence colleague. Robert E. Howard was a member of the Lovecraft Writing Circle, and often corresponded with Lovecraft to craft ideas for stories. 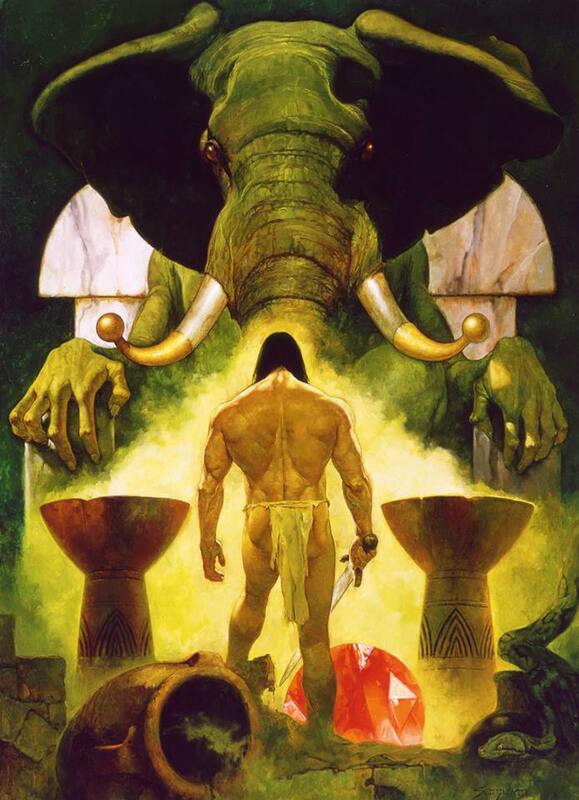 The short story “Tower of the Elephant” is an excellent example of Conan facing off against the endless horror of the Great Old Ones. Yag-Kosha is a being from beyond the stars, trapped by a wizard. Conan helps to free the monster, thus allowing the wizard to face his terrible fate at the hands of Yag-Kosha. Yag-Kosha describes his life in The Tower of the Elephant. Long before the dawn of man, and before even the Hyborian age began on Earth, a conflict raged on the far-distant world of Yag. The noble and peaceful people retreated into exile across the stars, coming at last to Earth. Here they hid in the deep jungles, living simple lives of hunter-gatherers, and not interfering with the evolution and history of humanity. However, as time went by, more and more of the people died, and at last only Yag-Kosha remained. Deep in the jungles of Khitai, he adopted a tribe of humans, teaching them the ways of civilization and being worshipped as a god. Then one day Yag-Kosha met Yara. Yara was a student of lore and sorcery, and had come to Yag-Kosha to learn from the wise and knowledgeable alien. Yag-Kosha made an effort to teach Yara humility and morality, but Yara was interested in only power. He betrayed his mentor, confining him and torturing him until he could draw more secrets of sorcery from the peaceful exile. Back in the west, he tortured Yag-Kosha and made him a magical slave, forcing him to build the Elephant Tower and do other deeds. In this time, over hundreds of years, he withered from torture and confinement, and knew only suffering. By the time of the events of “the Tower of the Elephant,” the poor creature was blind and nearly helpless. He convinced Conan to slay him as part of a final spell which gave him revenge over the evil Yara, and in doing so, was reincarnated as Yogah of Yag. He destroyed the Elephant Tower, and flew away to parts unknown.